Veal Chops Duxelles, Thyme for Cooking easy main course. Fall is the perfect time to make the classic Duxelles or minced mushrooms sauce. With shallots, a bit of wine and tomato, this is excellent to serve with veal chops or chicken breasts. Heat the butter in a medium nonstick skillet over medium heat until bubbly. Add the shallots, mushrooms and sauté, until golden brown, 6 - 8 minutes. In nonstick skillet large enough to hold both chops heat the oil over medium-high heat. Add chops and brown, about 3 minutes per side. Cover pan, remove from heat and let rest for a few minutes, until done to your preference, 2 - 3 minutes more for pink in the center. 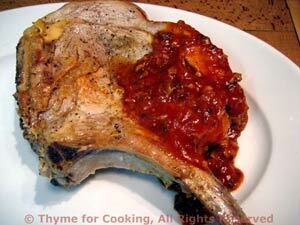 Remove chops to a small platter, spoon half the sauce over and serve.